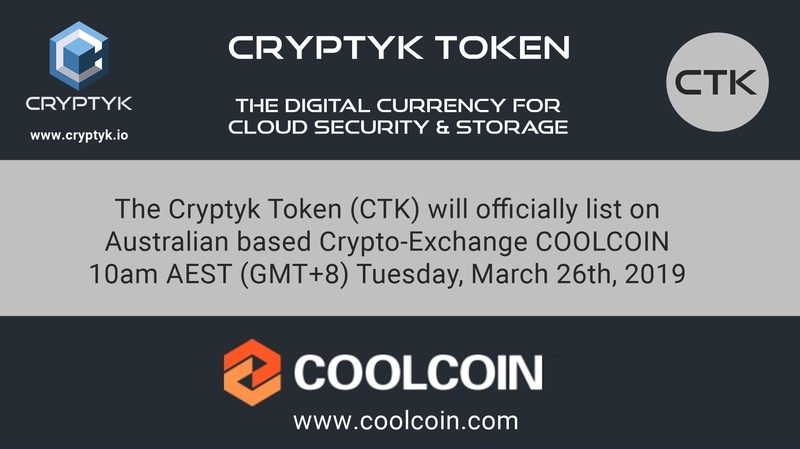 SAN FRANCISCO, Calif., March 24, 2019 -- Cryptyk Inc., a US based developer of enterprise-class cyber-security and cloud storage products, today announced the second listing of its new digital currency, the Cryptyk Token (CTK), on the Australian based Coolcoin exchange. The Cryptyk platform is driven by the CTK Token which provides financial incentives for not only CTK investors and traders, but also third-party app developers and enterprise customers. The company is not only building a security and storage platform but an entirely independent cyber-security economy. As a digital token with practical utility, increased customer adoption of its product platform will place increased demand on the CTK market economy. Consequently, the value of CTK will automatically increase with each new enterprise customer. After the debut listing of the CTK Token on global Top 30 exchange Cointiger last week, Cryptyk has chosen Australian based Coolcoin exchange for its second CTK listing. Trading of CTK is scheduled to open on Coolcoin at 10am AEST (GMT+8), Tuesday March 26th, 2019. The initial currency trading pairs will be CTK-USDT (ie: Tether) and CTK-BTC (ie: Bitcoin). The CTK Token is an ERC-20 Ethereum based digital token and its opening price upon listing on Coolcoin is expected to be around the 0.025 - 0.035 USDT price range. Given that the average sale price of CTK during its recent token sale was US$0.076, this represents a very attractively priced opportunity to purchase CTK tokens for a long term investment. Coolcoin is the Australian subsidiary of Top 50 exchange Coinegg and is building a strong presence with both Australian investors and Chinese investors throughout SE Asia. Cryptyk CEO Dr. Adam Weigold commented today that “we are very pleased for our second exchange listing to be with an emerging Australian based company like Coolcoin. Not only am I and several other Cryptyk team members Australian, we also have a significant Australian investor base from our recent token sale. With Cointiger and Coolcoin as our first two exchange listings we have started building the CTK trading economy with both a global and regional focus that makes sense for our team, customers and community."